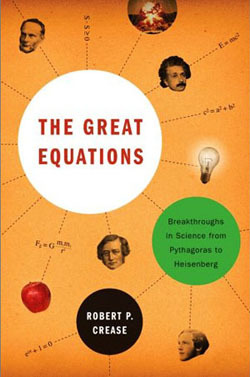 The Great Equations tells the stories of ten seminal equations, revealing the personal struggles of their ingenious originators and the impact that their work had on civilization. Crease locates the equations in the panoramic sweep of Western history, showing that they are as integral to their time and place of creation as are great works of art. We follow Socrates as he coaxes a slave boy to prove the Pythagorean Theorem, we see the high Shakespearean drama behind the Second Law of Thermodynamics, and we are treated to passages from Schrödinger and Heisenberg’s often emotional letters over wave mechanics. Like the very equations it celebrates, The Great Equations proves that scientific meaning is not confined to labs and textbooks but is also present in visions of the world that are born in moments of puzzlement, frustration and wonder.